Her outstretched tongue distinguishes her from all other goddesses in the Hindu pantheon. Her nakedness, unbound hair, association with blood and gore, and unbridled sexuality challenge conventional ideas of divinity. 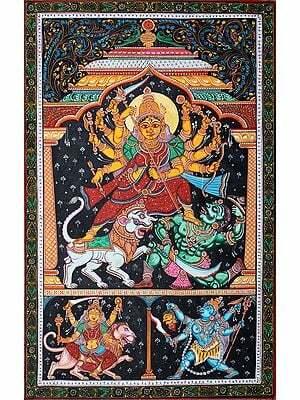 Yet, this is the picture Kali is mostly represented in and revered. The skulls and the bones scattered around tell that the scene of the event is a cremation ground. With a snake around his neck, Shiva lies on the ground. His arm is raised to support his head that is crowned with matted hair (Jata Mukuta). He is adorned with ornaments that are not necessary for an ascetic like him. His half closed eyes depict a serenity that belies the aggressive scene. 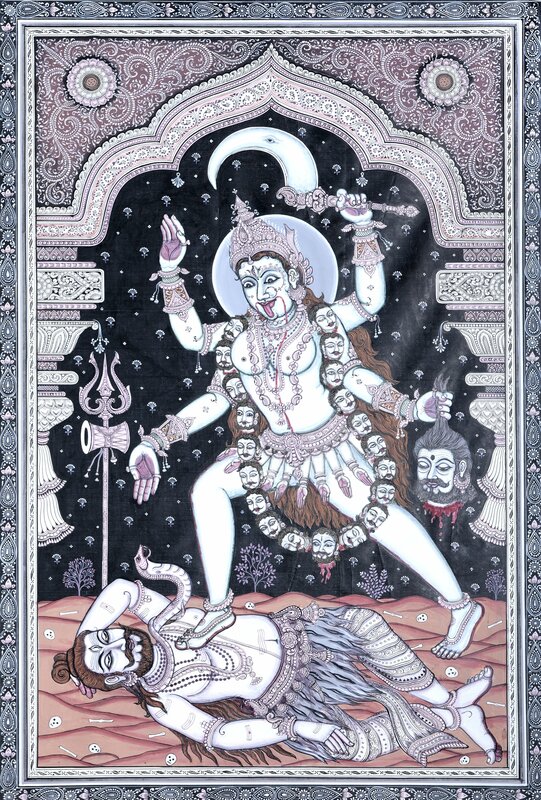 The four-armed Kali looks terrifying with the head of a slain man in one hand and the weapon of offence in the other. Her face is smeared with blood and pupils dilated. She looks more fearsome because of the garland of skulls and a waistband made of human hands. She wears exquisite jewellery and a crown that in no way add to the composition. Yet, contrary to the looks, her hands are raised in abhaya and varada mudra. She steps on Shiva's chest and quickly tries to retrieve her step on realizing that its Shiva under her foot. The artist has abandoned bright colour in favour of black and white and then some soft pink to avoid being categorized as a monochromatic composition. This description by Renu Rana.